We are a people-driven organisation committed to growing wellness and a high quality of life through healthy working relationships. We are a people-driven organisation committed to growing wellness and a high quality of life through harmonious working relationships with all stakeholders, including customers, employees, business partners and investors. Some 5,600 regular employees of the Group work at our plantation, manufacturing facilities, administrative and marketing offices. About 2,100 regular employees work in the United States and Mexico, while 3,500 are employees based in the Philippines and Singapore. Given that our employees are our most valuable resource, we are committed to fundamental human rights and adherence to labour standards. The farm and production facilities employ people from surrounding communities in the Philippines. Workers are paid above average rates in the industry and are informed of the terms and conditions of employment prior to their appointment. They undergo medical examinations annually and whenever required. Child and forced labour and any other form of exploitation are not allowed. Discrimination on the grounds of nationality, ethnicity, religion, age and gender is against the Group’s Code of Business Ethics. We are committed to ensuring our employees’ health and safety. Providing employees with a safe work environment is one of our priorities. We value our employees in a way that makes life better for every member of the organisation. Moreover, ensuring the health and safety of our employees reduces costs arising from lost-time injuries and medical leaves. In the US, we strive to provide a workplace free of preventable hazards. We comply with all laws and regulations governing workplace safety and health, including the Occupational Safety and Health (OSH) Act. In the Philippines, we consistently provide safety training to plantation and cannery employees and enforce the use of personal protective equipment required in performing their assigned duties and responsibilities. DMPI work committees identify potential safety risks and hazards, and devise action plans to mitigate or avoid its occurrence. Safety programmes are implemented and process improvements are made to ensure workplace health and safety. 1. In the US, we apply DuPont’s award-winning Safety Training Observation Programme at every facility. Through this training, our employees are able to identify and communicate safe and unsafe conditions and acts. By feeling confident and being able to talk to others about safety, our employees work together to prevent incidents from occurring, especially at our production facilities where there are higher risks, and by extension, more incidents. 2. In FY2018, Del Monte experienced a Total Incident Rate (TIR) of 2.62 and a severity rate of US$0.12 per hour worked – which is far below the most recent Bureau of Labour Statistics (2015) TIR of 5.2 for the fruit and vegetable canning industry. 3. In the Philippines, the Workplace Environment Monitoring programme also verifies the company’s compliance with the standards of the OSH of Department of Labour and Employment which includes measurements of workplace’s air quality, noise level, illumination, temperature, relative humidity, vibration and heat stress. 4. Our managers and supervisors are expected to keep abreast of the workplace’s safety laws and regulations that apply to their areas of responsibility and ensure compliance with these provisions. 5. Facilities in the Philippines have Emergency Response Teams and Fire Brigade Teams, which are identified and trained for cases of crises and these teams lead the conduct of regular Emergency Preparedness Drills to ensure that all employees are aware of what to do in case of emergencies and natural disasters. 6. Safety trainings have been extended to our service providers in both the plantation and cannery. 7. We conduct periodic inspection of trucks and forums on safety and training on defensive driving to help reduce our accident rate in the Philippine cannery and plantation. 8. Our office in Manila - the Jose Y Campos Centre building - was certified LEED Silver by the USBGC for being energy and water efficient and for using safe materials, providing employees with a safe and healthy work environment. 9. DMPI audits the toll manufacturers regularly for compliance with all laws and regulations governing workplace safety and health, including Occupational Safety and Health Regulations. 10. Toll manufacturers in the Philippines provide ongoing safety training to all their employees, enforce the use of personal protective equipment required in performing their assigned duties and responsibilities and conduct periodic Work Environment Measurements for noise, illumination, nuisance dust particles and fumes to ensure suitability of work environment. The Group has a Code of Conduct for employees and suppliers that strengthens our commitment to fundamental human rights and adherence to labour standards. Both DMFI and DMPI are members of the Supplier Ethical Data Exchange to ensure compliance in the supply chain. In the US, over 64% of the Company’s seasonal hourly employees are part of unions that help advocate fair wages and working conditions. DMFI’s philosophy holds that promoting diversity in the workplace is a means of encouraging personal and organisational growth and contribution, and further enables individuals and teams. Furthermore, workplace diversity reflects the changing face of the American workforce and population, as well as our customer base. In reflection of this, we promote managers irrespective of race or gender. For the last couple of years, despite changes to our business, the number of women in senior leadership roles increased from 13 to 19%. Similarly, the number of diverse employees in senior leadership increased from 18 to 24%. In the Philippines, the Company performs periodic audits of contract manufacturers and certain direct suppliers. Some independent and unannounced audits are used to address quality assurance and compliance issues. Labour-Management Cooperation (LMC) councils meet regularly to discuss and decide on issues affecting employees, their families, the Company and the communities where we operate. 1. Workers are paid above minimum wage and average rates in the industry, and are informed of the terms and conditions of employment prior to their appointment. 2. Our farm and production facilities employ people from surrounding communities and they undergo annual physical examinations. 3. LMCs prepare the groundwork for efficient and swift negotiations between Union and Management, as manifested in the signing of two memorandums of agreements covering enhanced economic and social benefits for about 55% of the total regular employees at the plantation and cannery in the Philippines. 4. An LMC Day enjoins plantation union members to celebrate ‘wins’, including innovations whose benefits have created benefits beyond their own families. In the United States, employee benefits are designed to provide employees the ability to select a package of coverage that meets their unique needs and their dependents, including children, spouses and domestic partners. DMFI offers additional benefits that help our employees improve their quality of life, including an adoption assistance programme, community service day allocation (one volunteer day time-off per year), product donations and floating holidays (at designated locations). In the Philippines, Del Monte complements government-mandated privileges for all full-time employees and qualified dependents with a broad range of free medical and dental services, a comprehensive retirement package and voluntary plans for providential and insurance benefits. Memorandums of agreement with the labour unions stipulate wage increases and enhancements in benefits for farm and factory workers from year to year. 2. Plantation employees live with their families in Group-owned houses and dormitories (for unmarried employees). 3. Employee-organised cooperatives provide our workers with services that enhance economic benefits for their families. Cooperative members enjoy annual dividends and patronage refunds. 4. Children of cannery employees enjoy free year-round weekend tutorials in basketball and, as scheduled, other sports (tennis, swimming, martial arts) and creative skills (photography, theatre arts). Core values are introduced through learning exposure that helps them grow a strong sense of community and family life. Building a culture of engagement is a continuing journey. It requires commitment from everyone in the organisation. The Group involves employees in various activities that promote a healthy work-life integration. The Group’s commitment to engagement is a journey worth taking. It is one way we nourish our employees, enrich lives, every day. 2. In December 2016, the Employee Council in Cabuyao Plant in the Philippines was established to provide a venue for employees and management to have the opportunity to promote a thriving and healthy work environment in the Philippines. 3. Del Monte in the Philippines believes that Engagement is everyone’s responsibility. To understand the Company’s strengths and areas for improvement, we partnered with Gallup and conducted a survey which garnered 96% participation rate amongst the business units. 4. 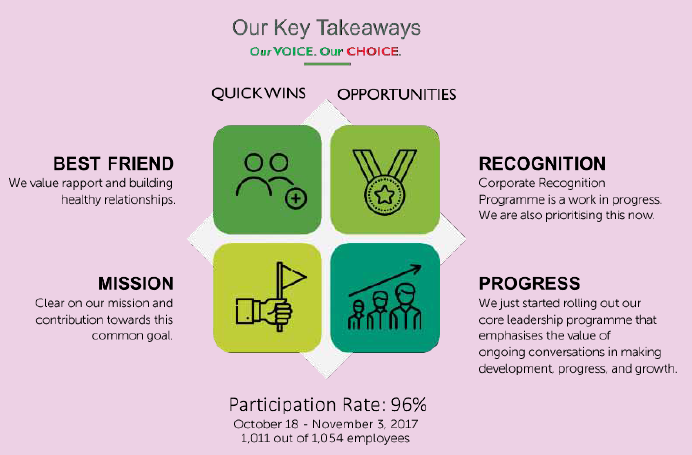 “Our Voice, Our Choice” survey allowed them to closely look at the critical elements that enable employee engagement. It captured employee feedback for the Company which was beneficial in creating an environment that fosters employee engagement. It also allowed the Company to educate managers on how engagement is created, measured, and sustained amongst their teams. 5. Employee Engagement is one of DMPI’s key priorities. This survey becomes the basis for action plans to continuously engage employees. The results show a great opportunity to further increase employee engagement. 6. As a way to improve employee communication, our Human Resources Department in the Philippines has enhanced our online HR Information System called MyHR, utilising technology for fast and accurate employment transactions. Other employee engagement initiatives by the company are the “Montee” stores where employees can purchase DMPL products at a discount. 7. We extensively cascaded our Del Monte CHOICE Values to employees across all levels (from Operating Committee [OPCOM] to Rank & File), locations and divisions. Crowdsourced data from the series of Cascades are analysed and used as reference in enhancing or designing our people programmes, strategies and initiatives to drive employee engagement, e.g. “Leaders As People Development Partners Workshop,” etc. 8. Employee engagement activities conducted by the HR Department in the Philippines include social gatherings, Team Building, Christmas Party, Fun Day and Sports Fest, amongst others. Del Monte helps employees integrate their work with their personal lives. Providing employees programmes that help balance their work and family life will assist the Group and employees in fulfilling their goals both inside and outside work. Del Monte in the United States fosters a diverse and welcoming workplace focused on mutual respect. Most importantly, DMFI encourages employees to maintain a healthy work-life balance. The Company supports employees in pursuit of healthier lifestyles and even provide our employees with financial assistance to engage in health and well-being programmes. Del Monte in the Philippines launched several programmes to improve employees’ work-life integration such as sports and family events, movie nights, educational talks and symposiums, pre-retirement seminars and trainings on health and safety. 1. In the Philippines, various sports and exercise activities such as Running, Zumba, Yoga, Crossfit and other sporting events are sponsored by the Company. The Company has also provided summer programmes for employees’ dependents. 2. The Company sponsors events such as Summer Outing, DMPI Day, Halloween, and “Tigum Sa Pasko” at Christmas, where employees can bring their families to these events. 3. To help employees know their benefits, speakers from the government agencies such as Social Security System, Philippine Health Insurance Corporation and Home Development Mutual Fund are invited to give an update on the latest benefits and offerings they have. 4. Financial Wellness Brown Bag sessions enable employees to manage their finances and prepare for a more secure and financially-rewarding future. 5. To emphasise our mission on Health and Wellness, the Company provides educational sessions on proper nutrition and balanced diet. In addition, several symposiums focusing on lifestyle diseases are held to increase awareness and how to combat these diseases. 6. The Company sponsors a series of Pre-Retirement Seminars to help near-retiring employees holistically prepare for their retirement. The programme enables participants to effectively plan and manage the key stages of the transition process and make more informed decisions for a secure and rewarding retirement. Employees with a partner jointly take a serious look at the necessary adjustments when the employee finally retires from the Company. 7. To celebrate Women’s month, the Company holds a series of symposiums on women empowerment and improving women’s confidence. 8. We hold movie nights for employees where movies are shown at the end of the week to help relieve stress. In the United States, professional development is part of our performance system and links to our core values and competencies. DMFI management supports and encourages employees to participate in career development activities that will contribute to their ability to deliver value and ensure further growth and success for themselves and the Company. “We choose to be excellent in everything we do.” This is DMPI’s commitment, embedded in our CHOICE Values, in building our employees’ competencies to better equip them for the future. Del Monte’s “Roadmap to Global Competitiveness” in the Philippines starts with building on the capabilities of each employee on the ground with the Centre of Excellence on Talent Management. We have developed a competency framework for key leaders at the plantation, cannery and marketing that will guide their teams towards achieving the Company’s strategic roadmap. The framework pinpoints the specific technical and operational skill set each team member must develop to deliver high performance. 1. DMFI offers an Education Assistance Programme to help employees develop and enhance their careers. a. Managers provide internal learning opportunities by working closely with employees to structure appropriate on-the-job activities to meet identified developmental needs. b. External programmes and professional certifications are supported via seminars, conferences, or other specialised workshops. c. External university courses are available through the Del Monte Employee Education Assistance Programme. Under the provisions of this programme, eligible employees may receive up to US$5,250 annually in financial assistance for approved courses of study at accredited educational institutions. 3. DMFI offers over 50 training programmes annually for hourly employees to ensure they have the necessary skills and information to conduct high-quality and safe work that meets the Company’s expectations and standards. 4. A management succession plan is fully in place, with a bench of candidates trained amongst our ranks to be able to immediately assume responsibilities of key management positions in the event of vacancy. 5. In the Philippines, DMPI’s GR8 (Great) Del Monte Leadership Competency Model serves as our guide in developing our leaders, to enable them to coach and collaboratively lead teams towards achieving the Company’s operational and business goals. We balance the leadership equation by developing Del Monte Leaders who are not only competent but also serve as models who live out our Del Monte CHOICE (Core Values). 6. Each Competency Framework also serves as a foundation for broad-range people programmes on recruitment, learning, career development, succession planning and performance management. 7. Fully supported by a powerhouse OPCOM Corporate Faculty, our in-house Basic Management Programme aims to broaden and sharpen our Managers’ perspective and understanding of the business, enables them to adapt to dynamic business situations, and manage effects of business volatility and changes to people, process, culture and mindset. 8. The Company’s Moving Up to Supervision Series aims to equip our young leaders with basic leadership skills that allow them to effectively perform their new role as people managers. These weekly classroom sessions complement formal technical trainings, coaching/mentoring and intensive on-the-job experience provided via structured Cannery Operations and Plantation Operations Supervisory Training Programmes. 9. The Company’s average training hours in the Philippines increased by 25% versus last year. This covers leadership and business training, culture-build, technical and regulatory training programmes.